Nabobo-Baba, U. et.al. 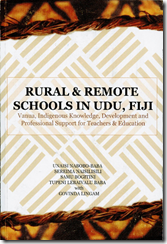 (2012).Fiji: University of the South Pacific-FALE & Native Academy Publishers. Four Parts, 412 pages. $40.00USD. (Paperback).ISBN: 978-982-01-0886-8. The University of the South Pacific (USP), one of two regionally owned universities in the world-the other being the University of West Indies serves its 12 member Pacific Island countries where much of the population live in rural, remote and isolated islands. These “unseen” populace and their realities are necessary to our discourses and debates in education and development. The ideas and philosophies of their ways of life, their struggles, their responses to development needs of the school and of teaching as a profession, must be researched and should constitute an important agenda of research. The Academy in this case the USP must continue to find ways to attend to rural students, schools, teachers and communities in creative ways, The challenges of a regional institution like USP to do so and do so effectively will continue to pose challenges – challenges that are decades old as well as those that are as old as the countries themselves. 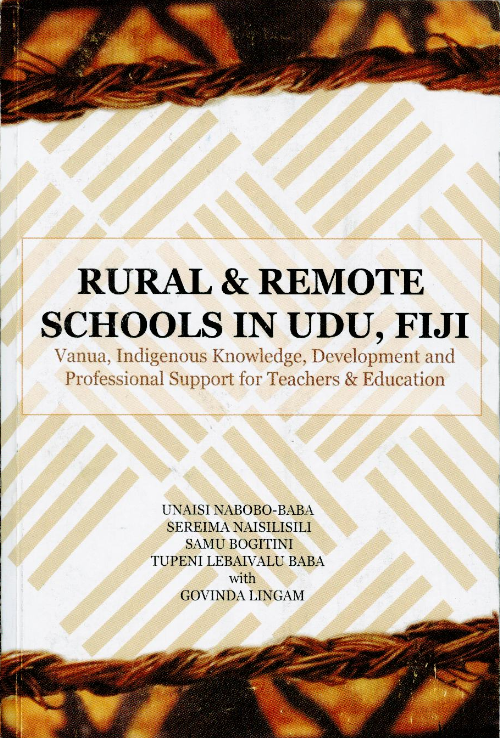 In the vanua (tribe) context, the regional university evidently like the government that pays the teachers and provides the school curriculum must work with and acknowledge vanua processes. Community processes like the vanua processes as in the case of Udu schools mediate how schools, teachers carry out their business. An understanding of the context of the community especially its decision making processes and economic power bases may enhance the academy in its attempt to “reach” rural teachers. This is also true of Government in its attempt to service rural schools and their communities given that local governance processes in Fiji’s 20 year history of military coups, as well as globalisation, pose new possibilities and challenges to teachers and schools in rural and remote places. Advances in ICT is proving to be a solution but can also create further digital divide if care is not taken to address not exacerbate existing disparities among the rich and poor within regions of a country like Fiji and other Pacific islands countries. Begs the question – Must a university heavily subsidise its services in order that its third world clientele get the development “goods” others elsewhere enjoy?. The role of national governments in ICT development and access for its rural communities also come into question here. Perhaps regional alternatives too of access and equity to education and training are needed and may be an agenda for regional leaders’ fora as education has historically been a force for good but it has also been a force that promotes inequity and differential delivery. The future must see us continually asking questions to redress past inequalities and address potential future developments of the same. 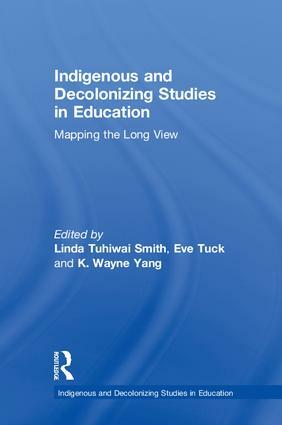 Guided closely by post-colonial critiques of knowledge and especially of the attempt worldwide to question the dominance of certain knowledge framings in research and writing, the study conscientiously framed its work given the methodological debates by Smith (1999) and the alternatives to methodologies (Grant and Giddings, 2002). This is to ensure the IK and processes of Fijians and specifically Udu peoples are embraced and acknowledged. The study utilized ethnographic techniques of in-depth interviews, participant observations and document study. The study was guided closely by Fijian Vanua Research Frameworks honouring local wisdoms and processes of knowledges, indigenous to context. This is why the book also highlights iluvatu as metaphor and derivative of Vanua framings to situate its findings and processes in the vanua Cuku (as home of the iluvatu mat) and Udu Point. This is a brief extract from Unaisi Nabobo-Baba Knowing and Learning: An indigenous Fijian approach (Suva: IPS Publications, 2006 , pp. 94-98). Here she outlines different meanings that silence has in a traditional Fijian community. This complex reading of silence challenges a Western attitude which associates silence with lack of intelligence. Nabobo-Baba’s approach has particular relevance to educators. In Vugalei epistemology, silence plays a major role, equal to that of verbalizing. Offering a taxonomy of silence and outlining appropriate examples, both questions and puts into context the importance of verbalized communication, and demonstrates the importance of the non-verbalized communication that is contained in silence. Silence, as explicated in the taxonomy, says as much about Vugalei epistemology and culture as does verbal language. Silence is pivotal to the Vugalei.1 It emits dignity, and summons a respect that transcends all in a vanua. It gives the vanua its value and its strength. The vanua is said to have mana when it is vakanomodi (encompassed in deep silence). When the vanua assembles, deep silence reflects how people regard their vanua, chief, god, ancestors, and relatives.There is eloquence in silence, and things important in a ceremony are best observed in silence. Silence is a pedagogy of deep engagement between participants. In Vugalei the word for silence is noma. Increasingly, people use the word galu or vagagalu. Nomo is the base word for vakanomodi, which is the adjective that describes how quiet a place or an event is. The opposite of nomo is sosa or kosakosa\ both these words mean noise or disturbance and connote a situation that lacks peace. Another antonym of vakanomodi is the word vakasausa (to deliberately make noise so as to offend and show disrespect). Vugalei people believe all spaces are occupied, or taw a, hence the importance of observing silence in all places. Vugalei people perceive silence as indicative of high birth and an excellent upbringing. It is culturally desirable. However, in most schools and universities, silence, that is the absence of verbal replies, questions and comments from students, is interpreted by educators as a sign of stupidity or lack of participation, and is considered a problem. Outlined below is a suggested cultural taxonomy of silence, which I developed from interview data and my observations of the Vugalei, as they live their lives. When the vanua assembles, there is silence; only a handful of persons are entitled to speak. The vanua dictates such behaviour and protocols. An example of silence and the vanua occurred at a meeting of representatives of the Tailevu Provincial Council Office and the men and chiefs of Vugalei, convened to discuss the how mahogany plantations in Vugalei were to be harvested and the returns would be distributed. The meeting was quiet save for the government committee members, who busied themselves trying to explain what appeared to be inexplicable. Then a momo, a wise, white- haired elder, a maternal uncle, knelt and spoke. He spoke with the dignity and authority of clan truth. It was his place to speak as well as his right and obligation to reprimand those that appeared to be ‘wronging’ the clan. After he spoke, all the elders of Vugalei present and the chiefs retreated into a silence that, often misinterpreted as acquiescence, signalled total opposition by the people to the government proposal. In all vanua meetings I attended, there was a prevailing silence. When elders speak, all listen. A monologue by the chief, is heard by the meeting in silence. Any response, if verbal, will be done by the right people, at the right time. Silence does not necessarily suggest acceptance or agreement; it can suggest a continuum of reactions from total opposition on the one hand to complete support. E nagauna ni bose vakoro, warai na vivosaki se vakasosa e colo. E ra vosa na na moro vosa. 0 ratou na qaravi yaqona e ratou dabe galugalu tu …. E bibi na bose vata na qaravi ni yaqona. In village meetings, there is no unnecessary talking in the upper part of the meeting house. Only those who are destined or born to talk, do the talking. Those that serve the yaqona do so quietly, they do not chat. The meeting is an impor­tant part of vanua life; it is respectcd, and so is the serving of th <t yaqona. The Vugalei are often heard to say, ‘Na vagagalu e bibi kina ka dokai kina na vanua’ (‘Silence puts weight and respect on the vanua’). Noise, particularly disruptive noise, is considered i tovo ni kaisi (the manner of the common folk) and is not tolerated. E da dau vakarokoroko, e rokovi na vanua, na tamata, e da dau vakatabuya kina na kaikaila tu e loma ni koro. We respect the vanua, the people, this is why we forbid people from yelling or shouting in the village. In Vugalei, silence is also observed in the presence of older people; we lower our voices to signify respect and allow only their voices to be heard. This is the same sort of silence given to a chief, which allows the voice and wisdom of the chief to be heard and acknowledged. Na sevusevu e bibi. E rokovi, e tabu ni dua e curu mai, tabu ni dua na vosa e rogo. Ni sa coboti maka sara na yaqona, ni sa maca na yaqona vakaturaga sa rawa ni qui ia na curu mai vi ira se tu e tuba, na tama mai, vata na vivosaki e loma ni vale. Sevusevu is important. It is respected, no-one is allowed to enter the house or building while it is on, no-one is allowed to chat or be noisy. After the first mix is served, what we called the yaqona vakaturaga (grog for chiefs or leaders), the situation is more relaxed. The silence can be broken after the first bowl is empty and people have all clapped to acknowledge that that is so. The value of silence is again demonstrated in the following report of a betrothal, in which silence was central to the display of respect between relatives and reflected the seriousness of the ceremony. The day of the betrothal came. The visiting party (five or six relatives of the betrothed boy) approached the house to the sound of tama (customary cries of greeting) and, having being given affirmative replies from inside, slowly entered, heads bowed. Silence was the dominant ‘voice’, indicating the importance and seriousness of the occasion. Lilieta [the prospective bride] was then summoned … to come and sit in the sitting-room with an aunt, while the visiting party began their requests. The speech highlighted their intentions for Lilieta, their blood ties to the host, the importance of keeping blood ties and the vanua strong by way of the marriage, and their belief that the occasion would be blessed by God and their ancestors. The hosts then replied, the speaker affirming the visitors’ words and emphasizing how the marriage would unite related people and maintain blood ties. Lilieta was then asked to declare her wishes with regard to the visiting party’s intentions. She maintained her silence for a while. She was asked three times before she spoke of her wishes. This silence was important, as a well-brought- up girl would be expected to show (by her silence) that she is not at all keen to leave her home. She finally agreed and a handful of whales’ teeth were presented to the hosts by the visitors in recognition of the agreement. Na vakanomodi (deep silence) demonstrates deep respect for an occasion. It also denotes a common understanding and reverence for what is important to the vanua and to the ceremony. Relationships and the purposes of the ceremony are honoured by ceremonial silence. It was a bold and ambitious move from SAVAH, which attracted academics from across the world, particularly the Americas, Australasia, Europe and other countries of Africa. The conference began with the CIHA board giving papers about the importance of South in the discipline of art history. This was followed by papers that reflected various corners of the South. Through an analysis of Rorke’s Drift, Elizabeth Rankin identified social critique as a key element in South African modernism. Robyn Sloggett spoke about the Leonard Adam collection in Melbourne and argued that his category of ‘primitive art’ was liberating at the time. Jonathan Mane Wheoki constructed at Whakapapa (genealogy) of Maori modernism which offered an alternative methodology for art history (hopefully one day applied to art outside New Zealand as well). After this initial positive statement of southness, the panel sessions that followed were dominated by a critique of northern dominance. The main argument was that the major centres of collecting and criticism in the North take a superficial view of the South, which reflects more their own interests than the real experience of artists and audiences from the periphery. This resentment never really had the opportunity to engage with the CIHA position, which served to only confirm its perceived marginality. While cathartic, this resentment distracted attention away from the key question: How might the methodologies of art history in the South might evolve parallel to those in the North? 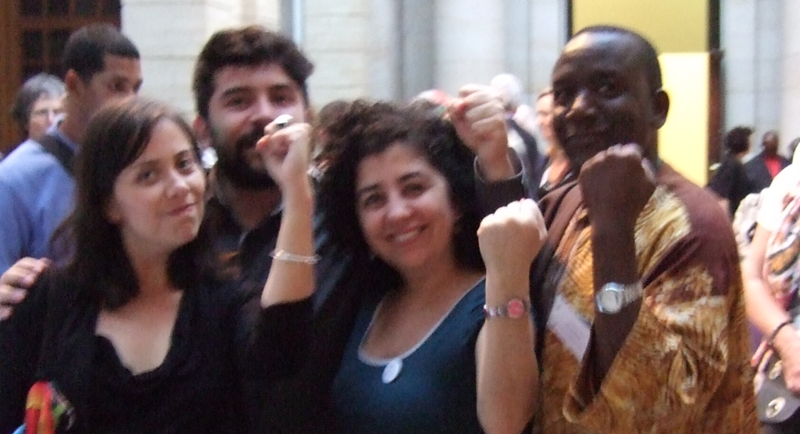 In South Africa and other countries of the South, the subjects of non-Western influence are not tribes or villages in distant lands, but peoples who co-exist with academics inside robust democratic cultures. From this perspective, the Northern practice of art history can seem rather forensic. It scrutinises the object for signs of lost meaning – precise, but sterile. By contrast, in the South there is the opportunity to engage with artists in a broader conversation that shares the origins of their work. The contributions to the panel that I organised, ‘Where to put the baskets in an art gallery?’ demonstrated this broader engagement. The panel was prompted by the experience of visiting to the Johannesburg Art Gallery and finding a sharp division between the craft of black rural women in the shop and the works from urban, mostly white, artists in the gallery. How is this still possible in the ‘new’ South Africa? Though publications like the Journal of Modern Craft are building up a substantial body of scholarship, craft is still perceived as a quite minor element in art history. Yet as an ‘excluded’ art form practiced by communities across the South, it offered the opportunity to make a critical contribution. Rather than focussing on the objects as such, the papers reflected on the process of craft production. John Steel presented a story of the Eastern Cape potter Alice Gqa Nongebeza, who wood-fires her pots adapting traditional methods to her own distinct personal style. ‘Mastooana Sekokotoana from Lesotho spoke about the Marija museum and associated arts and crafts festival, concluding the need for a ‘living treasure’ program to recognise masters of traditional skills. Though not specifically about craft, Pam Zeplin’s analysis of the South Project pointed to the engaging way its southern events brought together artists and craftspersons through workshops and performances. This was art not as the history of dead objects, but as a living entity with whom one must engage. In present circumstances, it seems that the southern perspective on art history offers something quite important to the global discipline of art history. There is a sense of declining interest in art history in universities. For good or for ill, the specialist appreciation of art is at odds with the kinds of democratic energies which seek to open up closed fields of knowledge. We see this most dramatically with the breaching of the diplomatic core by Wikileaks. But parallel challenges have appeared in a wide variety of media, including bloggers who challenge the profession of journalism and YouTube performers becoming celebrities. How can art history respond to this energy without losing the invaluable legacy of specialist knowledge, techniques and taste that it has developed over centuries? One possibility is to engage in a process of consultation with the broader field of art practice. This would involve conversations with the subjects of art history about their own interest in what the field produces. Boaventura de Sousa Santos talks about an ‘ecology of knowledge’ as constitutive of a southern epistemology. There are developments in anthropology such as the Fijian Vanua Framework for Research discussed by Unaisi Nabobo-Baba that identifies protocols for gaining traditional knowledge. Such knowledge is seen as more than a mirror to the world, but a practice with real world implications. The importance of this locally is reflected in the criticism by black South African curator Khwezi Gule of the work by Bitterkomix for the way it confirms the racial fears of white Afrikaners. (Despite the best intentions of organisers, the symposium lacked voices of local black academics. Why would they decline the invitation?) In the colloquium, this spirit was reflected in the inspiring presentation by Zambian Mwape J. Mumbi, which ended with a call to ‘humanise museums’. No doubt there would be resistance to the idea of protocols for art history. For academics suffering audit-fatigue, it may represent yet another hurdle after ethics committees. For those who have a territorial attachment to their subject, the consultation process may represent an external threat. But for the discipline as a whole, the development of protocols offers an alternative to both the forensic style of methodology and the impotent sense of resentment from those in the margins. Particularly, in giving a voice to the subject of art history, it offers the chance for the democratic powers that are gathering around us to be a strength growing within the discipline rather than a threat from without. The day after the colloquium, in Desmond Tutu’s Soweto church, a young woman orator delivered the sermon of the day. She talked about the need to leave behind the ‘comfort zone’ of historical pain and face a new future. To great applause, she urged the congregation to ‘Stop being “black”!’ “Black” was gestured in large quotation marks. Voices like hers are necessary to find a way out of those quotation marks. Ursula Helg from Vienna was the exception. Due to the tyranny of distance, she was forced to read into objects for meaning, rather than engage with her subject directly. Still, her comparison of beaded works from South African and European contexts offered a promising new formal method of analysis.